Our "Homemade" Collection is all about a home and what it means to us. 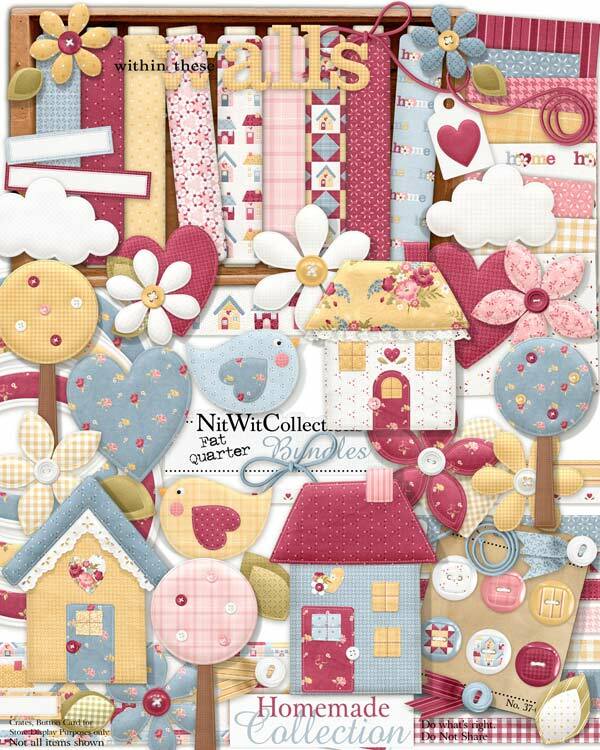 Created with fresh and cheerful colours, this kit has stitched digital elements and papers galore that are all about home. The birds singing outside your window, the flowers poking their heads through the soil and all of the feelings that our homes give to us. Joy, happiness, growth and more!! Don't pass by this fabric feel kit...remember the fond memories that it has brought and share these memories with others. 2 Birds just waiting to serenade you! 6 Buttons to "hold it all together with"
3 Button ties...really cute elements to look like you have everything "pinned" down! 3 Frames - what will you frame on your layouts and cards? 1 Heart with flowers - doesn't it make you smile inside?? 3 Strings - with ends that look like you wrapped them around your finger....I can never remember what I was supposed to remember! 1 Wordart - "Within these Walls"